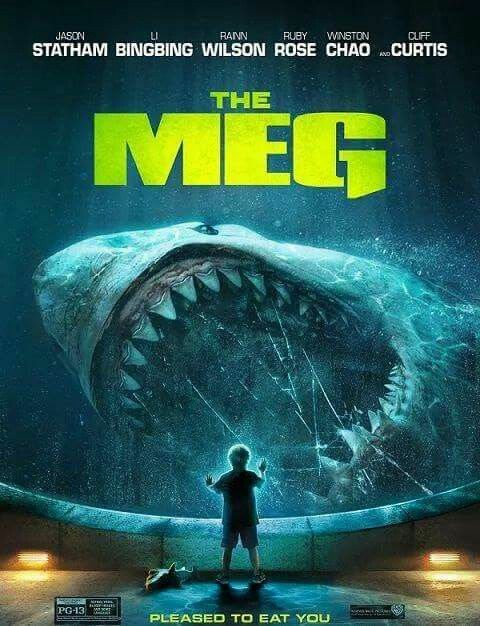 The Meg. No, not the Mila Kunis voiced teenager from Family Guy, but rather, a megalodon shark. In the modern day. With Jason Statham, Li Bingbing and Ruby Rose. What do I think of it? Well, for starters, I think referring to it as a “science fiction action thriller”, which are literally the words that Wikipedia uses, is a bit misleading. Sure, there are science fiction aspects to the film, sure there are action elements, and I’m sure some people find it thrilling. Me? I think it’s a comedy. And with a tag-line like that, who can argue with me? Long story short, Jason Statham plays a diver that specialises in rescue missions and gets roped in to help save a bunch of people from the deepest part of the ocean. No, not there, somewhere even deeper than that. Their actions end up unleashing a megaladon upon the world, and they decide they must stop it. With murder. Then what else are we going to think beyond “this is funny”? . The casting is well done, I’ll admit. Statham can pull off the comedy action role very well, with everyone else fitting the look and sound of their character brilliantly. Together, they form a formidable cast with some great chemistry between them. It would be a shame for you to miss out on it. In terms of the plot, it’s a bit far fetched, but it’s significantly better than the premise of the Sharknado, or Piranha, series’. It moves along at a remarkable pace, from one set piece to another with surprising speed. It’s enjoyable to watch, and despite a bit of far-fetchedness, I had a lot of fun whilst it was on. I expected not to, but I did. Now, I have a stance on the soundtrack. If you notice it, it hasn’t done it’s job properly. With the exception of one point during the movie, it blends nicely into the action, and the exception was during a transition piece and is a naturally obnoxious song designed to draw your attention to it. That’s right, it’s Toni Basil’s Mickey, but in Thai. Because you won’t believe it til you hear it. So, all in all, a generally pleasant film. Watch it, give it a go. You’ll have fun, I’m sure. And if not, then comment, let us know, vent your frustration at us on either our Facebook Page, Twitter or in the comments section below.